This faculty guide helps instructors incorporate the individual components of Japanese: The Spoken Language, Multimedia Collection into their curricula. "This interactive CD-ROM program is a powerful tool for beginning learners of Japanese and is based on Part 1 of the popular Japanese: The Spoken Language textbook series. The two-disc set—available in both Macintosh and PC-compatible formats—presents JSL’s sound methodology in a rich multimedia environment. Innovative, fully interactive exercises, simulations, and reviews complement the textbook. The program contains 125 “Core Conversation” video clips, activities, helpful notes about language and culture, and student review and assessment, with native Japanese speakers providing conversation models throughout. Whether used in the classroom or for self-study, the CD-ROM program encourages students to complete the tasks necessary to communicate successfully in Japanese and makes learning both enjoyable and rewarding. To purchase the institutional version, containing 10 CD-ROM sets, 10 User's Guides, and one Faculty Guide, click here." Japanese: The Spoken Language has been written by Eleanor Harz Jorden, with collaboration by Mari Noda, to replace her widely used Beginning Japanese in introductory and intermediate courses. Extensive changes and innovations are incorporated into this three-volume textbook to improve it as a teaching tool. Stressing Japanese as it is spoken today in Japan, the books introduce the language in a totally systematic fashion and in manageable segments, so that students who have mastered the full thirty lessons can handle the spoken language with considerable facility. The core conversations—all brief and natural—cover situations in which foreigners typically find themselves interacting with Japanese. They include topics ranging from asking directions and ordering a meal to more challenging discussions on how to refuse, criticize, disagree, and complain. Hundreds of drills—incorporating thousands of exchanges—are all in a response format, so that each exchange constitutes a mini-conversation. Explanations, presented in the detail and depth that a newcomer to the Japanese language urgently requires, offers not only linguistic analysis but also careful descriptions of how the language is used within Japanese society. They include such important topics as hierarchy, in-group/out-group differentiation, and avoidance of confrontation. Supplementary material provides outlines for the utilization of what has been introduced, check-ups on structure, and comprehension checks based on accompanying audiotapes. This text is a Kanji supplement to Book Two of the entirely romanized Japanese: The Spoken Language series. Japanese for Young People is a new three-level series designed primarily for junior-high and high school curricula encouraging systematic Japanese-language acquisition through an enjoyable but structured learning process. With an emphasis on coordination of structure and verbal communication skills, this first Student Book introduces the building-blocks of Japanese grammer through Key Sentences, Dialogues, Exercises, and Tasks. 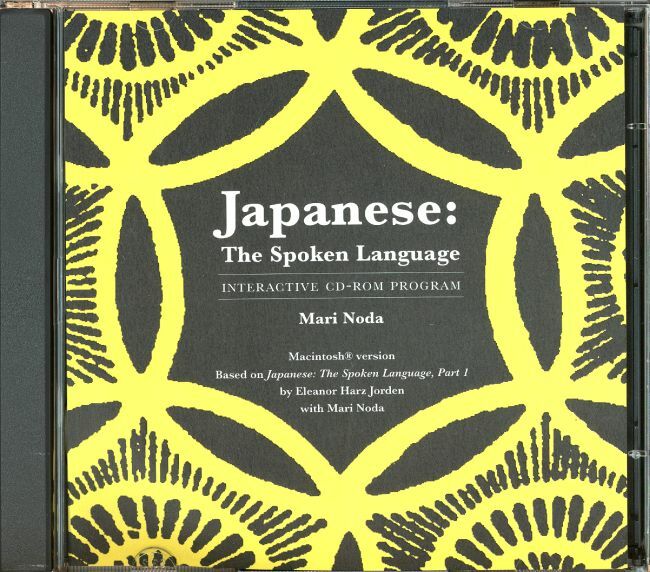 This interactive CD-ROM program is a powerful tool for beginning learners of Japanese and is based on Part 1 of the popular Japanese: The Spoken Language textbook series. The two-disc set—available in both Macintosh and PC-compatible formats—presents JSL’s sound methodology in a rich multimedia environment. Innovative, fully interactive exercises, simulations, and reviews complement the textbook. The program contains 125 “Core Conversation” video clips, activities, helpful notes about language and culture, and student review and assessment, with native Japanese speakers providing conversation models throughout. Whether used in the classroom or for self-study, the CD-ROM program encourages students to complete the tasks necessary to communicate successfully in Japanese and makes learning both enjoyable and rewarding. A User’s Guide, included with the CD-ROMS (and also sold separately), offers clear, concise instructions for the program's most effective use. In addition, it provides comprehensive guidance for learners of Japanese and answers to some of their commonly asked questions. A Faculty Guide is also available to help instructors incorporate into their curricula the components of Japanese: The Spoken Language, Multimedia Collection—a grouping of new and previously published text, audio, video, and CD-ROM materials that together form a complete package for learning and teaching spoken Japanese at the beginning level. The institutional version of this product contains 10 CD-ROM sets, 10 User's Guides, and one Faculty Guide. In one compact volume, Japanese Verbs & Essentials of Grammar, Second Edition, offers an integrated beginner's guide to all major verbal and grammatical concepts of the Japanese language. This latest edition of the popular and accessible guide has been updated to include: * Expanded vocabulary lists featuring common idiomatic phrases * New examples of sentences and sentence structure * An in-depth introduction to Japanese scripts Each of the 46 units includes clear explanations and examples to help you master the Japanese language. Roomaji, or transliteration, is featured throughout. This self-study text offers a breakthrough approach for beginning learners of Japanese, as well as an indispensable reference for intermediate students. The unique study method in Japanese Step By Step teaches how to construct Japanese sentences, from the simplest to the most complex, using an easy-to-follow, step-by-step method. Also contains flow charts for verb conjugations and derivations.